As an accomplished personal injury attorney, Chris Olsen has helped numerous victims of catastrophic motorcycle, truck, and car accidents obtain compensation for their losses and expenses and find some semblance of justice in the aftermath of their injuries. He has successfully handled the full range of auto accident cases, including those involving whiplash injuries. Victims of San Diego auto accidents and whiplash injuries can depend on Mr. Olsen to use all of the resources at his disposal to present the strongest cases possible on their behalf and to fight tirelessly for the full measure of compensation to which they are legally entitled. Through the years, whiplash has been misrepresented in the media, and on television programs in particular, as a minor and often exaggerated or made-up injury that auto accident victims use in an effort to swindle rich drivers out of their money. This portrayal of whiplash is far from the reality. In truth, whiplash is a potentially debilitating injury that can have devastating effects on a person’s ability to function and overall quality of life. In some cases, the effects can be relatively mild and short term; however, in others, the effects can last for years or even a lifetime. If you or a member of your family has suffered whiplash due to an auto accident caused by someone else’s negligence, you already know how painful the condition can be. Attorney Chris Olsen would be pleased to evaluate your case and advise you of your legal rights and options. 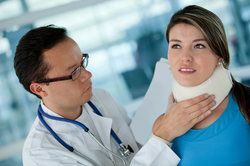 Whiplash is an injury that occurs when the neck is suddenly and violently jolted forward or backward. This jolt causes the muscles and ligaments of the neck to become stretched too far beyond their normal range of motion, resulting in a painful strain. It can occur during any collision, including a collision between two people during a contact sport such as football or a collision that results from a fall, but most often results from auto accidents. Depending on the severity of the strain, whiplash can last for days, months, or years. In the worst cases, whiplash can last a lifetime. Some people who experience pain in their necks after an auto accident immediately assume that they have suffered whiplash and do not seek the comprehensive medical care they require. This is a potentially fatal mistake. Even if they do have whiplash, they may also have suffered a more serious closed-head brain injury. Many traumatic brain injuries do not exhibit clear symptoms until they have increased in severity and caused long-term and possibly even lethal damage. This is why it is so important that auto accident victims be thoroughly examined after their accidents. To arrange for an evaluation of your auto accident case, please contact Olsen Law Offices today.